What is a Watershed Fact Sheet? Watershed Fact Sheets are short (typically one page, double sided), information-packed brochures for a stream basin. They provide information to the public about a watershed including, its human and natural history, threats to its health, organizations working to protect and restore the watershed, and what citizen’s can do to help. In short, a watershed fact sheet is a short synopsis of your watershed and an advertisement for your watershed group. Why Should I Create a Watershed Fact Sheet? Creating and distributing Watershed Fact Sheets helps to educate, engage, and empower watershed residents. Citizens that know the name of their local stream are more likely to work to protect it and citizens that are informed about environmental issues are more environmentally active. If you are a watershed group, another way of looking at Watershed Fact Sheets is to think of them as an advertisement for your group. They let the citizen’s of you watershed know about the treasures of your watershed, the threats facing them, that your organization is there to help, and that your organization can use their support. Creating a Watershed Fact Sheets is a relatively inexpensive proposition, however the costs associated with them can vary. Your goals for your fact sheet will in part determine the costs of their creation. Again, keep in mind your goals and audience in determining your workplan. For example, if your goal is to teach students about the idea of a watershed, you may want to involve them in the creation of your watershed fact sheet. There is no better type of learning than experiential learning! The cost associated with creating a watershed fact sheet can be as low as the price of printer ink and computer paper, however there are many optional costs depending on the amount of effort you wish to put into the fact sheet’s creation, the expertise and talents of your creation committee, and the media on which you would like to print your fact sheet. Web site hosting: A fact sheet can be integrated into your web site for free if someone in your group has web expertise. If you want to have a professional design and host your fact sheet, it could cost a few hundred dollars. Grants are available to pay for the creation and distribution of environmental education materials such as a fact sheet. In addition, you may be able to defray costs by asking local businesses to donate paper and/or donate the service of printing the fact sheets. Creating a fact sheet is a relatively straightforward process, however you will want to give yourself enough time to complete the process. Below is a list of steps for creating a fact sheet. By far step one, researching the fact sheet, will require the greatest amount of time and effort. This step alone can take several months depending on the resources available to you. Below is a general list of materials you will need if you are planning to research, write, and print your own fact sheet. Finding the materials to make a watershed fact sheet is the hardest part, but the good news is that it can be done without costing you or your organizations any money. It will however, take some time to get good, accurate information together. This is not a step to rush through. A list of actions that the reader can take to protect the watershed. There are several existing definitions for a watershed. The Environmental Protection Agency has this simple definition. Other definitions are available on the internet using “watershed definition” as a search term. Some of the definitions are more technical than others so choose the definition that is right for your audience. In general, information found on government websites is free for the public to use, however you should ask for permission to use the author’s words if you choose a definition from another source. The cost associated with putting together a watershed map can vary greatly. Going through a contractor may produce a high quality map, but may also be expensive. 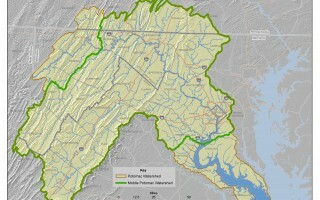 There are several sources for producing free maps for watersheds in the Potomac Basin. Some of the sources may only be able to produce maps for watersheds that are totally within their jurisdiction (for example, Pennsylvania may only have data for watersheds within its state boundaries). For watersheds that cross-state boundaries, we recommend that you contact one of the multi-jurisdictional agencies such as the Interstate Commission on the Potomac River Basin. In addition to the sources below, you should ask your county or city department of planning to see what resources they have available. The human history of a watershed provides information about the important historical events that took place in the basin and historic structures found there. The idea behind this section is to show people the important resources that they should want to protect. You can talk to your local historical society and university historians or go to a public or university library to research this information. Your local government may also have a list of historical properties and an area history; you can use this as a starting point for your research for the watershed. The natural history of a watershed is information about the flora and fauna found in the basin. This can be the number of species that make the watershed their home, the unique and interesting species that are there, and/or any endangered species that are found in your watershed. This information can be found from a variety of sources- local university biologists, county biologists, county agricultural and forest extension agents, local Audubon Society, as well as the local and nearby university libraries. Another great place to start is a local nature center. They will most likely have a list of the plants and wildlife found in the area and be able to point out species that are unique to your area, have interesting life histories, and/or are threatened with extinction. Information regarding watershed threats, steps that have been taken to protect it, and contact information on organizations working to protect and restore the area should be available with your county or city planning or environmental offices, local watershed and environmental organizations, and county and forest extension agents. Additionally, your state and the EPA have information on threats to drinking water and stream and river water quality. You probably can compile this list as you research your watershed’s natural history and the threats to its health—the organizations that are knowledgeable in these subjects are also probably the ones working in the watershed. When listing these organizations in your fact sheets, try to avoid information that changes often like names of personnel. Instead, stick with the basic information—the group’s name, its phone number, address, website address, and a general email address (if available). If applicable, highlight your organization here! There are literally thousands of simple actions that individuals can take to protect their watershed. It is up to you to decide which items to emphasize. In choosing which items to highlight, try to pick activities that fit with your group’s mission. The one item that should be on your list is to urge the reader to volunteer or join your organization! For a list of activities that the Interstate Commission on the Potomac River Basin highlights, check out our Watershed Activities to Encourage Restoration. Once you’ve finished researching for your fact sheet, begin formatting the document. Making a fact sheet is more of an art than a science. Try some different formats before settling on one you like. Just like a resume, you want your fact sheet to be different, eye-catching, and easy to read. How you print your fact sheets will depend on your audience and budget. If your budget allows, bring your fact sheet to a professional to have it printed—this will save you time and aggravation and you will generally get a higher quality product. If this is not possible you can print them all on your printer or you can print a master copy and make photocopies (black and white or color) from it. Printing your fact sheets on your own printer will produce the highest quality fact sheets that you can make yourself, however it is time consuming and it can be more expensive than making black and white photocopies. Making photocopies of a master is the fastest and cheapest method of printing, however it is also produces the lowest quality fact sheet. There are lots of ways to distribute your fact sheet. If you are working with a small watershed or in a specific neighborhood and you have some volunteer time, you may be able to go door to door to deliver them. If you have some money, you can pay for a mailing. Depending on the number, you may be able to do a bulk mailing through businesses like Mailboxes, Etc. Another way of mailing them is by contacting your local water utility. They will sometimes include special mailers with their bills for charity purposes, however, they may have size restrictions for your fact sheet. Remember, it is best to make use of several techniques if possible. You can also give them out at special events like, citizen or community association meetings, community festivals, conferences, local planning meetings, environmental restoration activities, garden club meetings. Another option is to place your fact sheets at locations where interested individuals can pick them up. You might leave them at bookstores, historic properties, nature centers, schools, recreational centers, libraries, 4-H clubs, and garden centers. Finally, if you have an electronic version, you can send it out by email to people you think would be interested and ask them to distribute it to their friends as well—this is the cheapest option of all for distributing them and printing them! The most budget-friendly option is electronic distribution. Send the fact sheets in an email to your supporters, post them on Facebook and other Social Media, and put them on your website. Encourage people to share them with others who live in the watershed.